At the age of 11 months, your baby is capable of eating almost all varieties of solid foods. The infant’s tastes are also well developed when they are around a year old. For this reason, parents should try feeding their 11-month-old babies a wide array of healthy foods. 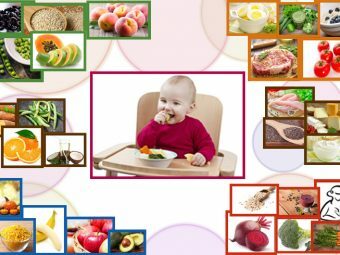 In this article, MomJunction presents the best types of foods that you can give to your 11-month-old baby, along with seven baby food recipes that provide adequate nourishment. 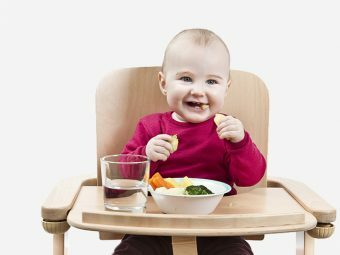 What Can A Baby Eat At 11 Months Of Age? How Much To Feed An 11-month-old? A baby can eat nearly all foods from various food categories at the age of 11 months. Babies can eat almost all fruits except for the citrus variety, which can be introduced only after the age of 12 months (1). Dairy products that an 11-month-old can have include yogurt, which you may have already introduced to the baby when they were eight months old (2). However, you must wait for them to complete 12 months before introducing cow milk (3). 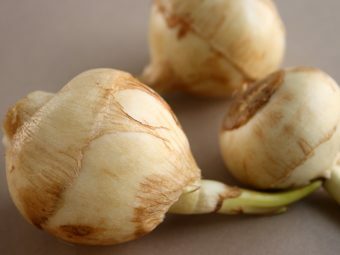 Nearly all vegetables can be given to 11-month-old babies. A few exceptions are tomatoes, raw carrots, and celery that should be given after the age of 12 months (4). All grains and cereals can be used to make cereal meals for the baby. All types of meat and poultry can be given, but egg should be given only after the child is a year old (5). To ensure adequate nutrition for the child, it is also essential to know the right quantities of these foods to serve the baby. An 11-month-old can have half-a-cup of solid food, three to four times a day (6). It is the minimum quantity that your baby can eat during mealtime. You can give a healthy snack or two between the main meals namely breakfast, lunch, and dinner. The meals (including snacks) should be an assortment of various foods to provide optimum nourishment to the baby. You must continue breastfeeding or formula feeding a baby besides giving them solid foods. An 11-month-old baby usually breastfeeds four times a day (7). Make a diet keeping that in mind, to ensure the baby gets the nutrition from breastfeeding as well as solid foods. Before bedtime 6 – 8oz (177 – 236ml) formula or breastmilk, followed by a small cup of water. Ensure that you brush the baby’s teeth before you put them to bed. Note: If you still breastfeed your 11-month-old, then there can be on-demand breastfeeds between the meals. Boil the carrot and chicken on a medium flame for about 25 minutes. You can cook them further if your baby prefers them soft. Once done cooking, sieve out the carrots and chicken. Do not discard the broth since you can use it for cooking other items. 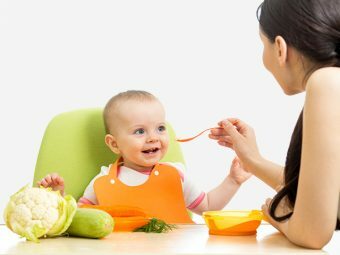 Cool the vegetables and then serve it as finger food to the 11-month-old baby. Put the sweet potatoes and squash in a cooking vessel and boil them for 20 minutes on full flame. You can consider cooking them in a pressure cooker if your baby loves them extra soft. Put the vegetables in a pressure cooker, fill it half with water, and cook on high flame for one whistle. After the whistle, turn the flame to medium and cook for nine minutes. You can shallow fry the boiled potatoes and squash. Use a one-third teaspoon of 100% rice bran oil on a pan and shallow fry the boiled vegetables till they are tender. Cool and serve. Boil the broccoli for eight minutes or more if your baby loves them tender. Heat oil in a cooking pan. Put the cottage cheese chunks, and shallow fry them till they turn a light brown color. Next put the broccoli and shallow fry it with the cottage cheese for a couple of minutes. Cool and serve it to the baby. Put the oats and water in a cooking vessel. Bring the water to boil and turn the flame to simmer. 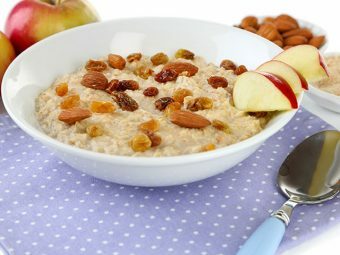 Cook the oats, while stirring it, for five minutes. Chop the banana into small pieces and mash it in a bowl. Let the cooked oats cool for a few minutes. Add the mashed banana and stir it well. Serve it to the baby. Put the blueberries and yogurt into a blender. Blend till the blueberries mix well with the yogurt. You can serve the yogurt as it is or with a cracker. Remove the skin of the apple and chop it into small pieces. Steam the apples using a vegetable/fruit steamer for three to five minutes. Boil the rice till tender. Mix the rice and steamed apples in a bowl. Mash them till they are soft and mixed well. Trim the ends of the green beans and cut them from the middle. Put the chopped beans into a cooking vessel and boil for 7-10 minutes. Scoop out the pulp from the avocado and transfer it into a blender. Add the boiled green beans as well. Blend till mixed consistently and feed the baby. 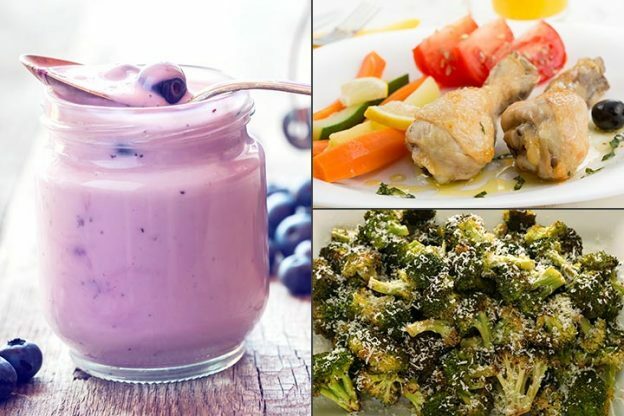 Work with an assortment of recipes: Alternate the recipes such that the infant gets all types of foods that supply the essential nutrients for healthy growth. A balanced diet is vital to help the infant grow better. Do not add salt: A baby only needs 0.4 g of sodium per day, up to the age of 12 months ( (9). Eleven-month-old babies will get all the sodium they need from formula and breast milk, as well as the vegetables you give them. Avoid adding excess salt to the food and always check for salt content of various foods before giving them to the baby. 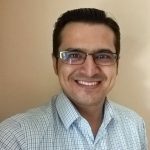 Never give fruit juice: The American Academy of Pediatrics recommends no fruit juice for children below the age of 12 months, as it offers no nutrition whatsoever (10). Feeding your 11-month-old is easier when you follow a diet plan that includes meals combining a variety of fruits, vegetables, and grains. Remember to alternate the recipes and give them as much variety of food as possible for a regular supply of the vital nutrients that become the building blocks for healthy growth. What foods did your 11-month-old baby enjoy the most? Tell us in the comment section below.